The most common causes of the gallbladder disease in pregnancy are gallstones and biliary sludge. The incidence of gallbladder disease in pregnancy is 0.05–0.3%, and asymptomatic gallstones occur in 3.5–10% of all pregnancies. The incidence of acute cholecystitis during pregnancy is one of the highest of nonobstetric operative conditions, and 40% of pregnant patients with symptomatic cholelithiasis require cholecystectomy during pregnancy. Natural history and clinical examination are similar as in nonpregnant population. Detailed therapeutic modalities include medical, open surgical, and laparoscopic procedures. 1/1200 pregnancies are complicated by common bile duct stones. Common bile duct stones have been observed in 10–12.5% of pregnant women undergoing cholecystectomy and account for 7% of cases of jaundice in pregnancy. 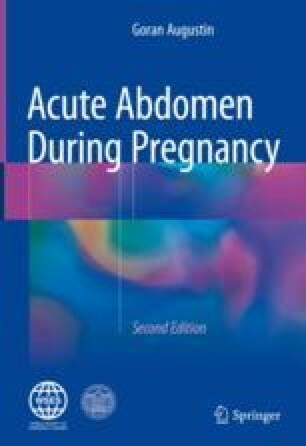 Diagnostic workup and therapeutic management are complex and depend on the status of the mother, severity of the disease, presence of infection, duration of pregnancy, and status of the fetus.